Chef Daniel Strackbein, owner of Rochester Deli, Inc. and Periwinkle’s Bakery on Broadway, LLC is a fully trained certified Chef and self taught baker who while working along side Pastry Chefs at some of the most prestigious clubs in Florida and Wisconsin developed a real passion for baking from scratch. With her father’s guidance spanning close to a decade in the family business, Chef Dan’s daughter, Alicia, became the head baker and wedding cake consultant in the family Deli’s rapidly growing bakery division. 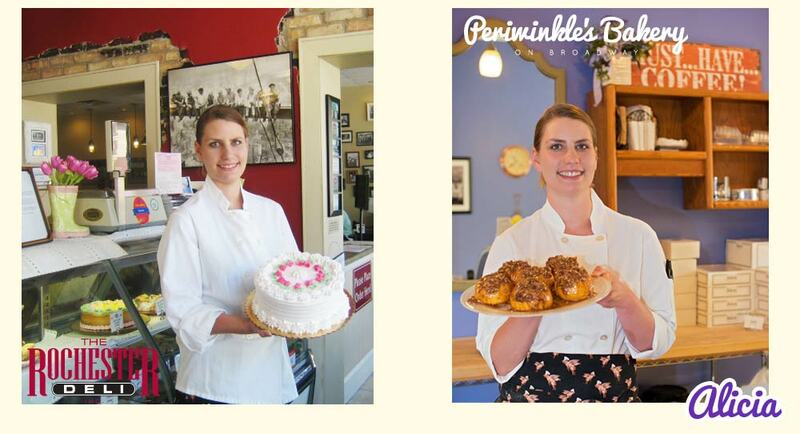 Inspired by the guidance of our loyal Rochester Deli customers, Periwinkle's Bakery on Broadway became a project of love and opened on October 18, 2013. An opportunity for expansion next door to the Deli allowed Alicia the ability to develop a brand of her own, in a kitchen of her own, with a baking team of her own, all with the loving support of her proud father. Our family recipes incorporate fresh, premium ingredients along with hard work and love to offer you the finest dessert selections. We hope you recognize the importance we place on quality and great customer service and allow us the opportunity to be your neighborhood baker. Please visit us at Rochester Deli and Periwinkle’s Bakery on Broadway for our wide variety of bakery made just for you!